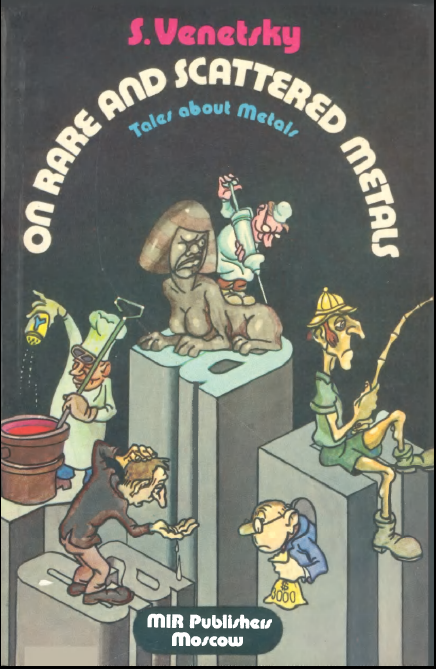 In this post we will see a book titled On Rare and Scattered Metals by S. Venetsky, which is a sort of sequel to the book titled Tales About Metals. This book tells about some rare metals (including those called trace elements) and can be regarded as a second part of S. I. Venetsky’s Tales About Metals (It was published in English by Mir Publishers, Moscow, in 1981). The author follows the same principle as in his previous work: rather than giving the reader any exhaustive information about every chemical element he describes, to tell him some interesting facts, curious incidents and tales associated with rare metals, to tell about the thorny path of any major scientific discovery and about some paths yet to be trodden in the amazing world of metals. There is a Marathi translation of the prequel Tales About Metals titled घातुंच्या नवलकथा and was one of the first Mir Books that I read. I do not know if there are translations of this book in any other Indian language, if you know of any, please let us know. Update: Hindi translation titled काहानियां धातुओं की for Tales About Metals is there and Marathi translation of On Rare and Scattered Metals titled दुर्मिळ आणि विखुरलेले धातु is there. Will try to post Tales About Metals soon is posted. This book was translated from the Russian by by N. G. Kittell, and was first published by Mir in 1983. Many thanks to gnv64 for making this available. To get torrent for this file go here. This entry was posted in books, chemistry, metals, mir books, mir publishers, science and tagged chemical, elements, hindi, marathi, metals, popular science, properties, radioactivity, rare metals, trace metals, venetsky. Bookmark the permalink. can you post links for Marathi translated books? please. i read by borrowing from a friend when i was a child and searching since then. Thank you for making old Mir titles available. I am particularly interested in Tales about Metals by S I Venetsky. Please post it if possible. You will see it in sometime. can you republish this book in marathi, i like very much both books.